Since I last updated here, it’s all gone a bit wrong (again). Small Boy has been out of school since two days after the start of the summer term. 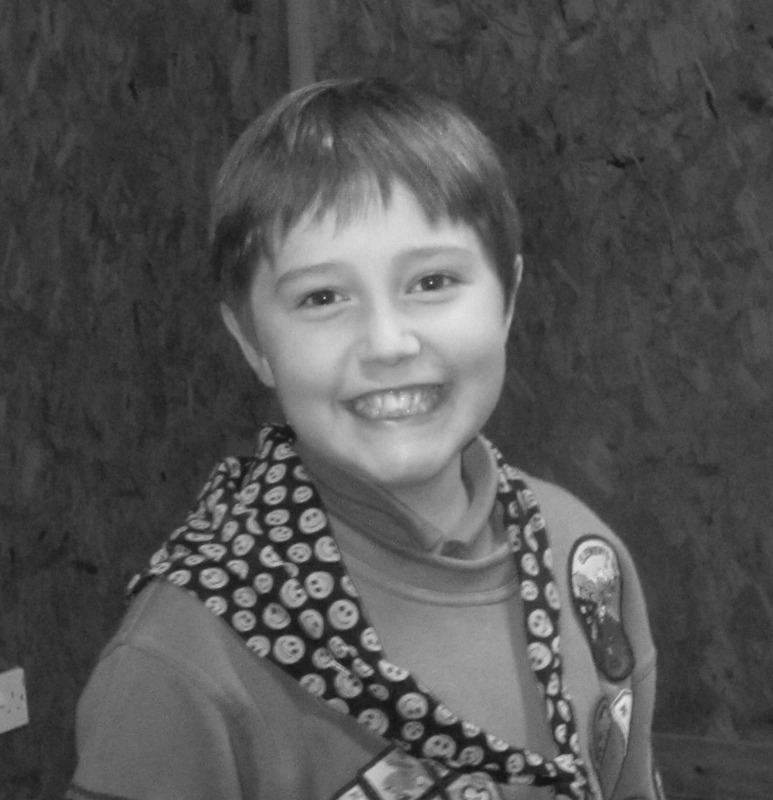 It was almost impossible to get him back to school after Easter, but the crunch came when I had Small Girl at a Camhs appointment and I spent 3/4 of it talking about SB. I had the light-bulb moment where I thought we’re damaging him, leaving him every day somewhere we have to drag him to screaming. The screaming is communication; all he can say is help me, and we’re not listening. We need to change this. I drove SG back to school for the afternoon session and he appeared at the staff room door while I was letting SG’s PSA know she was back on the premises. He had seen my car, and that I hadn’t driven straight off. He didn’t speak, just looked straight at me with tears shining in his eyes and wrapped his arms around my waist. I told him to collect all his belongings and to wait for me by his coat peg. Then I told the staff that the only sensible and kind thing I could do was to remove him until further notice. I assured them it was nothing they had done wrong (it really wasn’t) but it was hurting him, and my job was to protect him. The relief on his wee face was a wake up call if ever I needed one. I sent a text to Hubby to inform him of what I’d done, and not to be surprised if he called and heard SB in the background. And then we waited. The first two weeks were the worst. Somehow I’d got it into my head that away from the hyper-stimulating environment (or whatever) of school that he would quickly bounce back and “be himself.” That didn’t happen. He was rude, angry, aggressive, even violent, and my heart sank as I wondered if I had somehow made a bad situation worse. But I hadn’t, and my instincts were right. One day I got a smile, a genuine one. Then he asked a question – about the platypus as it happens – and we spent half an hour on Google, learning everything we could about the strange and frankly terrifying critters, and now, several weeks on, I can almost say I have my boy back. He’s still angry, and frustrated, and horribly panicked about any kind of change to his routine, but the absolute terror has mostly gone from his eyes. School are continuing to be wonderful in their support, and there is a team dedicated to trying to “fix” what went wrong. The only problem is that without the input of specialist services that deal with mental health issues, specifically those of young autistic people, we might not get much further. And guess which service we are still waiting on? Yes, you know it. Without knowing just what he can’t cope with, there is no way we are prepared to attempt to put him back into full time schooling, just to see the very same thing happen all over again. The stumbling block is that being only just 11, he has no idea what his triggers are. Having Teen Boy around is helpful, as we can take a stab at the worst of the probables, but they are not definite. TB has told us it was several years later that he finally managed to start filtering out the worst of his sensory issues, so it might be that part of what we have to do is wait until SB can do the same. Which doesn’t help much with school, but I refuse to rush him. He is autistic, and I will not shove him into a mainstream neurotypical pond and demand he swims like the NT fish because he can’t. And why should he? If he were blind, or in a wheelchair, the system would know it had to adapt for him. But because you can’t look at an autistic person and see the autism, for some reason it’s acceptable (well it’s really not but other people think it is) to squash and squeeze and push them until they are stuffed into the same round holes as everyone else, no matter that they are perfectly content to be square pegs. Well, this mumma says no! My square pegs require square holes, and if it takes yet another fight, bring it! In the mean time, SB is coping with one hour of practical science once a week, one to one with a PSA, and for some reason, 90 mins of PE too. Rather him than me *shudders*. For another time, I’ll write about our tentative journey into home education. Last time Small Boy was at the dentist there was concern raised about the way his teeth were fitting into his mouth i.e. at all the wrong angles. Knowing our family history, they recalled SB for a check up. He seemed fine about it at the time. Last night I reminded him he was having a check-up today. This morning I reminded him. An hour before the appointment time I gave him a five minute warning for brushing his teeth. And then I tried to brush them. Oh. Dear. Lord. I was even happy for him to do them (he usually does pretty well) but he backed away from me, and the loaded toothbrush went flying. Nothing I could say or do would convince him to open his mouth. Defeated, I put the brush away and thought, oh well, it won’t be the first time a dentist has been faced with a mouth that has remnants of bagel and hot chocolate in it; it could be worse. OK, take two – we’ll go as we are. Or not! For some reason SB had decided that he was going to “have teeth ripped out of me” and that he would be in terrible pain. As a total dental wimp myself I could sympathise but we were running short of time, and I knew that it was a check up and no more. But SB was at the point where the terror was about to spill over into a meltdown, and then I knew it would mean a cancelled appointment. He was curled into a ball, rocking and sobbing, and not able to hear what I was saying. The fear had taken over. Thankfully, the Skylander word was enough to get him to look up. I pressed home my advantage and repeated my offer. He got up, I shoved a tissue at his snotty nose and we high-tailed it out of the house like our backsides were on fire. Once in the car and moving, the doors lock automatically. If I’ve got that far, I can generally relax a bit. The dentist is new since SB’s last appointment, and he was AMAZING. I’d managed to scribble a few notes on a scrap of paper and the receptionist took it straight to him. He then came out to speak quietly to me, and said if the surgery was too frightening he would look at SB’s teeth right there in the waiting room. Is it OK to fall a little in love with your dentist at this point? Anyway, SB was OK with going into the surgery, although he still looked haunted. They turned off the lights as he has bad light sensitivity, gave him the big specs to wear, and then the dentist took over, checking all his teeth and explaining as he went along, without ever being condescending. SB began to relax a little, and at the end the dentist patiently suffered a long spiel about Pokemon, which he bore with a smile. SB will be referred to the orthodontist at the hospital as it’s very likely that he will need some teeth out, and train track braces (uh oh). All his notes including all the information about his autism and how it affects him will also be sent. He reassured SB that he is not allowed to be in pain at any time and that whatever treatment he has in the future they will all ensure to keep him pain free. This dentist is never allowed to leave our practice! We headed back home via the local town for a small bag of shopping. It was lunch time and I decided both children deserved a wee treat, so I gave them both chips for lunch. And yes, the second we were in the door, I found the Skylander. It was worth every penny to keep him calm. Hopefully he won’t need one every visit, but if that is what it takes to have healthy teeth, then so be it. It’s not been a great January so far. The weather has meant two separate days when we’ve woken up to an announcement of no school, and that has played havoc with M’s routine. She has a new class teacher and a new head teacher, both of whom she seems to actively like, but the ripples from the pebbles that have been thrown in her emotional pond have been far-reaching. The instances of shouting, screaming and hitting out have increased substantially – and bearing in mind December and the run-up to Christmas were no picnic – this is not insignificant. M has resorted to baby talk, increased use of her dummy (soother) when at home, as well as her cuddly toys and sensory items like her weighted blanket and her fleece blankets. She is always clingy to me but this has also increased, to the point I sometimes I feel I am in danger of suffocating under the weight of her need for me. I guess I didn’t help matters by “abandoning” her for an overnight stay in Glasgow when I drove E back to university on the day of my birthday. I had a fantastic weekend, including a cinema trip and some shopping time, as well as the pleasure of one to one time with my eldest child. I have been paying for it with heartfelt comments and tears ever since. M’s termly review meeting was last week and it was a good chance to let the staff know just how bad things had been at home. There is a new SfL (Support for Learning) teacher who comes in once a week and seems to know her stuff; she suggested several ways to try and improve things for M, all of which we will be putting into practice. One of them includes re-connecting with SaLT and making M a visual timetable for her entire week, in colour, that she can keep with her in an aid to lessen anxiety, along with a plan to sign the whole school. As language is the first thing to disappear when M is overwrought, the idea is to bring even a small measure of comfort by giving her the most access to converse as they can, and of course it means that there is more of a level playing field for any other children who may struggle, now or in the future. 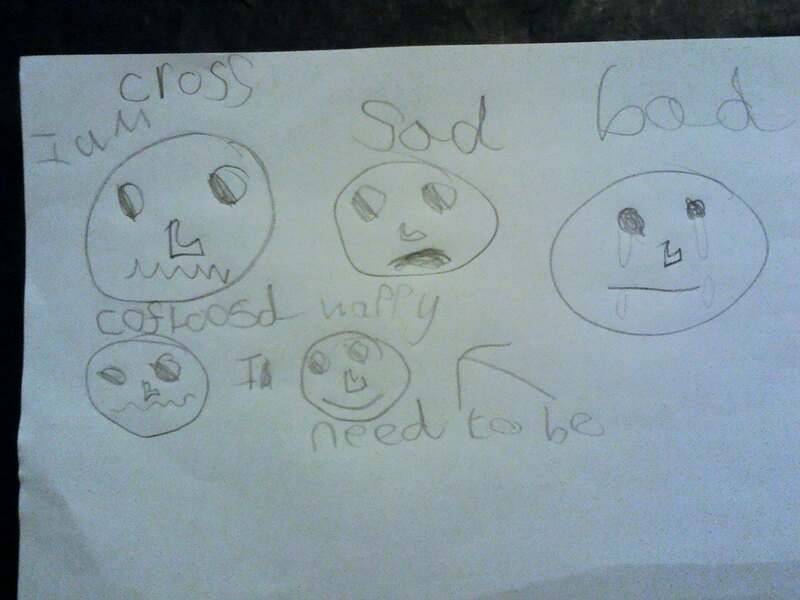 As well as M, we discussed B, her brother, who is struggling himself. He can’t seem to let go of the fact that fate has given him a sibling with autism and he needs to make allowances. He is quite an angry wee man and there are more plans in place now to help him deal with his emotions around all this. Coupled with R’s increasing anxiety about his forthcoming pre-lims and some very real concerns about his twin’s health (more of that another time) this isn’t a month I shall be sorry to see the back of. Not everything is bad news; I am enjoying escaping to write some more of my book, and have also been happily connecting with more writers on twitter and other social media, finding out that the peculiarities I have thought personal to me are perhaps more of a widespread curse on writers in general and maybe I’m not actually going totally mad. And the days are finally getting longer! It is such a relief to look out of the window at 4 pm and to still see the beach. 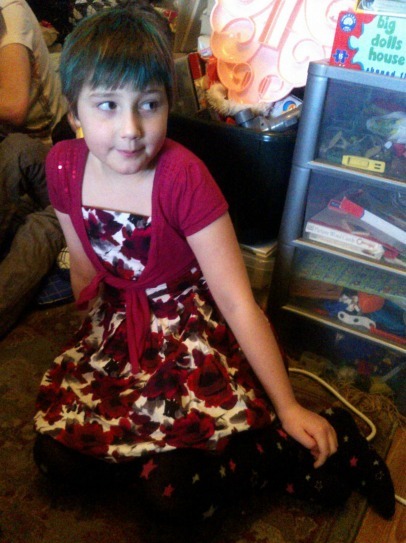 Here’s a little picture of M on Christmas Day. M has not enjoyed December. In fact, she has been on high alert since the schools went back after the half term break in October. Too many changes to the daily routine, and even when they have all been planned in advance, her autistic brain is on overload. Most afternoons and evenings there has been shouting and crying, to the point I seriously wondered about taking her out of school for the remainder of the term. But, then, would I be helping her if I did? Everybody has some form of stress to deal with, and M’s school is superb in how they adapt and handle her anxieties, which I fear will be part of her life for a long time, if not for ever. In the end, I left her in school and worked hard at reducing demands even further in the home. To date we still don’t have one single Christmas decoration up, and she has been allowed to trail her fleecy blankets, soft toys and soothers all over the house, even at the dinner table if it helps to keep her calm. And she has had a lot of baths. Our bath is huge and takes a lot of water to fill it even half way. 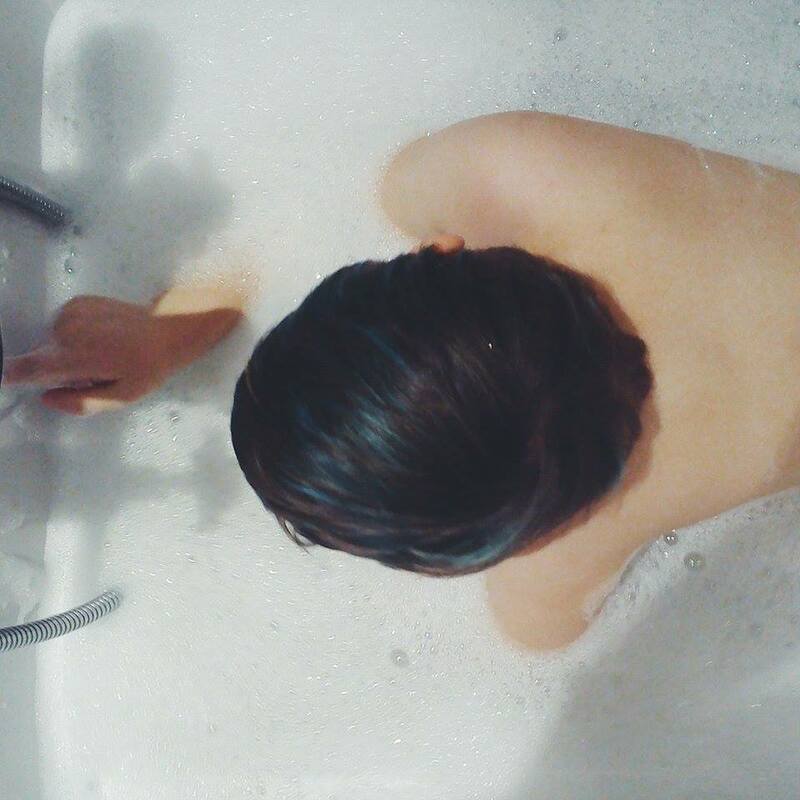 M adores water, it’s her primary sensory calming tool, and I am permanently grateful we don’t have a meter fitted. Her brother tends to have a shower first then we fill the bath and allow as many toys as M would like. She is always much happier after a good soak, although sadly there can be issues in getting her out of the tub. The evening will be Dr Who (of course!) and then in all probability a long bubble bath to help M wind down after a busy day. I guess what I’m saying is don’t feel you have to conform to what other people might expect of you for the festive season – if it works for you or your child, then go ahead and celebrate the way that you feel most comfortable, even if it does mean you spend 72 hours in your favourite pyjamas. I don’t know what is going on in M’s head right now but she’s not in her happy place, that’s for sure. The darker mornings are definitely helping her not to get out of bed so early, which is a real blessing in the half term. However, anything – and I mean anything – I try to get her to do, from eating to getting dressed, has been met with piercing screams. Sadly she has also been like to this to B, which isn’t great for either his sensitive ears or his nerves. I’ve been realising that he takes her sudden noisy mood changes to heart more than is healthy, BUT, and this is important, he still cannot resist winding her up. He really should know better by now. Anyhow, I thought getting everyone around the table for a delicious brunch of eggy bread might settle her, and it did for about half an hour. The screaming began again over something that was so insignificant it can’t even be called anything, and I stepped in. M was sobbing, and no cuddle was enough to comfort her. I suggested she might try and draw what was the matter, as it as helped in the past. To be honest I wasn’t expecting her to agree as she has been spectacularly resistant to anything she perceives as a demand, but she headed for the kitchen to find pencil and paper. She drew this. It broke my heart to see she labelled herself as bad. I’m not daft enough to think that sad wouldn’t have been on her list, but it hurts when your child is so desperately unhappy. 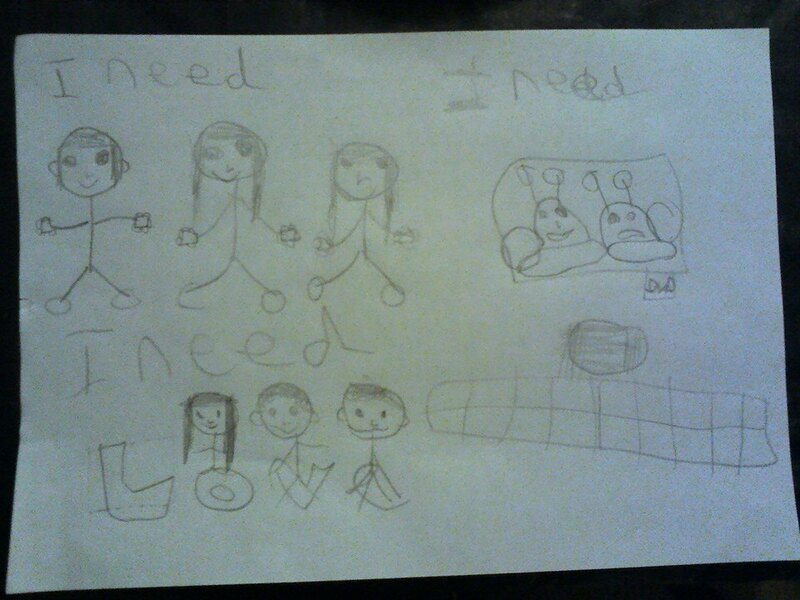 Part of me is immensely proud that she was able to draw and write how she was feeling so accurately. There was no way I could get any more than a shrug from her in conversation so to be able to locate and then articulate her emotions on paper is a huge step. It also shows how visual she is, all that information was locked up in a child who couldn’t verbalise one word of it. I reassured her that she is not bad, she might do “bad” things like throwing and hitting but that does not make her bad. I asked her if she wanted to draw things that would help her feel better, and she went off meekly to comply. Two “demands” in a row and she coped with them, a small breakthrough. This was her wish list. The top people are friends (not specified) and the bottom three are her siblings currently at home. On the right as you look at the picture is a TV and a sofa – her DVD viewing all sorted out. She was able to explain that she thought her siblings didn’t love her, which they do, but they had all shut her out today (realistically because she was driving them nuts) so I went with her to ask for a hug from each of them. Then I reluctantly let her watch a DVD. I have been trying to wean her off too much screen time but faced with such an obvious plea I would have felt utterly heartless doing anything else. The remainder of the day has been slightly easier. She got the play dough out after the DVD and was busy for ages making biscuits and cakes. I think the sensory feel of it is calming for her. Then we had a lovely Skype conversation with her big sister which left her laughing and happy. The visual side of Skype really engages her. She still hates the telephone. I do wonder if she is struggling to process the change between school and holiday time. She was in a state for several weeks after the summer holiday, and now we have similar behaviour. She would choose in a heartbeat to be at home rather than at school but she is not good at the switch, and it seems to be getting harder rather than easier. Right now she is asleep, and with any luck she will have a peaceful night. Tomorrow is another day. Clean slate time. I thought long and hard before deciding to share the photo in this post about whether M would be upset if she saw it. The aim of my blog when I’m talking about autism and sensory issues is to share our experiences and anything that might help other people in the same situation. I decided M would like to think that other people with extreme sensory difficulties would be pleased if they got some ideas from what helps her, so I have justified this post that way. Anyway, this all happened a week ago. It was Monday and the school had their sponsored walk to raise money for the Parent Council. My heart sinks when I hear the word “sponsor” as for people like us with no family nearby it basically means “put your hand in your pocket” but in this case I was more concerned that M would refuse to do the walk – she’s fine and happy to run about for hours on the beach, or to bounce for ages on the trampoline, but getting her actually walk anyway can be fraught with stress. The plan for the Junior class was to walk just over 2.5 miles to the local lighthouse, have a picnic there and a play on the rocks (how do you risk assess that eh?) and then walk back to school. Luckily it was a clear sunny day and I left her at school looking cheerful about the prospect of a day outside. As it was the last Monday in the month it was also her monthly additional needs drama club in town 40 miles away so I needed to pick her up half an hour earlier than school ends, something that is written into her plan. She came out smiling but I could tell she was weary. It was hot in the car and she took off her jumper after some persuasion. As I have a classic Land Rover there are no air bags in the front and as a treat I let her ride up front with me. She is just as safe there strapped in and with her booster seat than in the back, in fact possibly more so as she is always more relaxed and sits in her seat instead of trying constantly to lean forward to reach me. I had to open the windows and the sunroof to let some air in, but it does make it noisier. She was struggling and I passed her the ear defenders. Then she put her fleece back on. She was desperately unsettled and asked for her blanket. 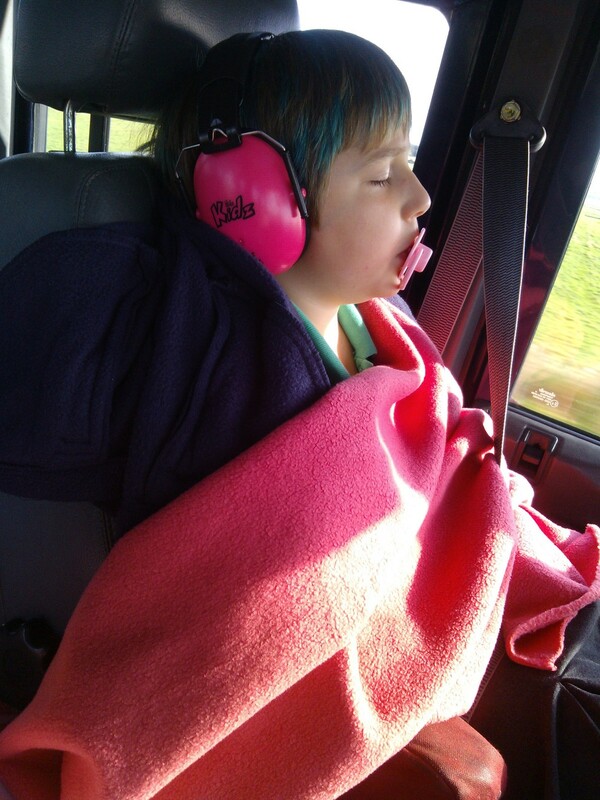 This is not her weighted blanket (which I have taken on longer journeys) but rather a length of pink fleece that I keep in the car for occasions like this. Even thought it was far too warm she draped the fleece around her and tucked herself in a cocoon. Then she tried to tip her head back. I shifted the seat but then her neck wasn’t comfortable, so my fleece got rolled up as a pillow. Finally I thought she was getting somewhere but she was still quite frantic under all the covers. I tentatively brought out my last weapon, the dreaded dummy (soother if you’re American). She took it gratefully and sank into a sort of trance for about thirty minutes. I know there is a lot of controversy about the use of dummies, and especially in a child of M’s age. All I can say is that her dentist thinks this is preferable to teeth-grinding so sometimes at night when M is particularly stressed, one of these is produced and she calms enough to sleep. I don’t use them often, and I’ve never used one in broad daylight before but it definitely did the trick. By the time we arrived at the theatre, she was calm and rested enough to face an hour of drama with no fuss or anxiety. I am still astounded that she preferred to be bundled up on a hot day in several layers of fleece (although fleece is her very favourite texture) but I could see that if I had tried to dissuade her from any of the calming measures she needed, the drive would probably have been very different, and not in a good way. She was physically drained but she was able to recharge happily and enjoy her class. However, I am seriously thinking about buying her some sensory chews from a website. A dummy is not a great look for an eight year old! I’ve just been to a MacMillan Coffee Morning at the school. Nothing unusual about that you might think. Well, no, there’s not. The children (Nursery, Infants, Juniors) take it in turn to perform some songs relevant to their recent learning, we applaud and then we tuck into scones and cakes that the staff have baked for us. We pay money and we go home happy after an hour of chatter and fund raising. This morning I didn’t take my camera. I felt I had been so reliant on it that it would do me good to see life through my eyes for once and not a lens. Of course I am now regretting that decision as I sat there and watched M, front row, quietly confident and looking so smart, singing every song word perfect, and with no hesitation. It took me until I got back home to realise her PSA wasn’t anywhere nearby (in fact she might have been taking a well-earned coffee break herself) but the fact is, last year M would have been on the end of a row, probably at the back and nearest the exit. I’m not saying she looked bursting with confidence – she didn’t. But no one who had dropped in from out of town would have had any clue that my little girl struggles every single day with the sensory and social demands that school places on her as an autistic person in a mainstream setting. Her school does everything it can to enable her to cope with the school day and it shows that they listen.